Surprise! Just beyond the stacks of bags of potatoes and onions and next to tropical houseplants and the “balloon center”—a Burpee seed rack—at our local Giant Foods store on January 6. 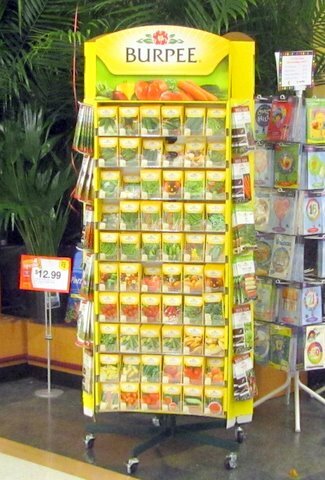 I don’t know what magician controls the timing of wintertime appearance of retail seed racks at our local stores, but last year seed racks appeared the first week of February. Not quite in numbed shock, I hustled right over to the Burpee display to take a look. Hmm—a panel of standard vegetable seeds—a panel of organic vegetable seeds. I needed look no farther. Two years ago, powdery mildew wiped out my whole cuke bed. In 2011 I planted Diva, a mildew-resistant variety, but leaf-spot diseases wiped out that planting. Will the third time, with Marketmore 76, be the charm? I hope so, so I put the packet into my shopping cart. As I walked toward the dairy section to pick up some provolone and a dozen eggs, I wondered whether Burpee or Giant has “inside information” that spring will come a month early this year. Punxsutawney Phil, shadow or not, you’re fired! Groundhogs get no respect here at Meadow Glenn, especially those that climb our hill and fence and chow down on springtime veggies. Today (Jan. 17) I went to Home Depot in Columbia to pick up a 10-foot PVC pipe that I’ll cut into 3 1/2-foot lengths to make “underpasses” for hoses under our front and back sidewalks. Those projects have been on my to-do list for 10 years, and, hold your breath, I installed the front one—the easier one—in less than an hour before lunch. While at Home Depot I glanced into the garden-supply room and—yes, you guessed it—two staffers were setting up seed racks. I temporarily abandoned my push-cart with the PVC pipe and took a look at the seed racks—Burpee, Ferry-Morse, and Martha. I suppressed the question of whether there’s horticultural significance that the two seed companies established by men go by their surnames while the one established by a woman goes by her given name. Since I already had looked over the Burpee rack at Giant, I looked at the Burpee racks at Home Depot first. At Home Depot, there must have been three or four times the number of vegetable and flower varieties and packets. The packets looked the same, but there were differences. The first difference I noticed was price. Most of the veggie packets at Giant were $1.79. At Home Depot, most were $1.00 or $1.49. 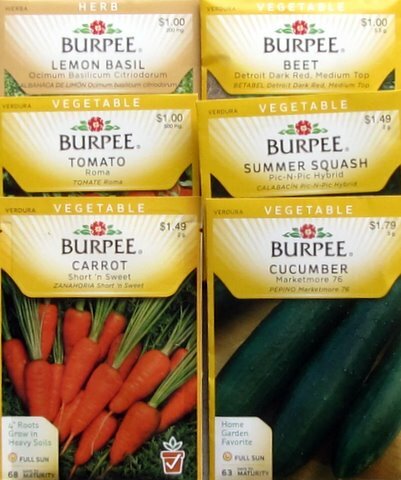 The second difference was that Burpee racks at Home Depot had more varieties of each vegetable—about a half dozen varieties of cuke seeds—but not Marketmore 76. Don’t assume the Burpee seed rack at Store A contains the same varieties at the same price as the Burpee seed rack at Store B.
I went to Home Depot this morning to buy PVC pipe, but I added seven packets of seeds. Herb and veggies: Lemon basil, $1.00, 200 mg.; Roma tomato, $1.00, 500 mg.; Detroit Dark Red, Medium Top beet, $1.00, 5.5 g.; Short ‘n Sweet carrot, $1.49, 2 g.; and Pic-N-Pic summer squash, $1.49, 2 g. Annual flowers: Red Velvet celosia, $1.49, 160 mg. and Exquisite zinnia, $1.49, 500 mg. 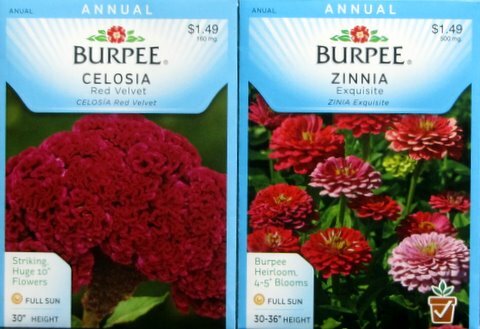 This Frugal Gardener remembers that the price of most similar packets in the Burpee catalog is $3.95. The seed racks I visited were good reminders that I’ve got to get out my seed catalogs, make selections, and order the rest of my 2012 vegetable seeds. Bob, it appears that the seed racks might be a better deal than a lot of the catalogs, and no shipping charge. I wonder why that is? I'm certainly going to check out the hardware stores before I place my orders, thanks for your research! I imagine the seed companies have several business models, depending on where seeds are sold. If the selling point is Home Depot or Walmart, the seed company apparently by contract prints the price on the packet as agreed with the retailer, which then has to figure out how make a few cents per package. On the other hand, the packets in the catalog most likely have to underwrite all the catalog costs (printing & mailing), Internet support, adverstising, warehouse, and staff costs. I suppose that's why a packet of Better Boy Hybrid tomato seeds costs $3.95 in the catalog and $1.19 at Home Depot. Usually, though, the racks at the big stores don't contain some of the varieties that you want and have seen in the catalog.